Since I posted the Pumpkin Roll on Monday, my email inbox has been overflowing with questions about this festive Thanksgiving dessert. Like I said in my original post, I’ve been making Pumpkin Rolls since I was a kid – so I could probably make one in my sleep. However, I realize that’s not the case for many of you. Since I’ve received some really great questions about the process, I thought I’d dedicate a post to some Pumpkin Roll Q & A.
I hope you find this post informative and it helps you to create this delicious, festive, show stopping Thanksgiving dessert. If I didn’t address something, feel free to leave a comment in this post or shoot me an email at jamie@mybakingaddiction.com. Q: What’s a jelly roll pan and what brand do you recommend? A: A jelly roll pan is a baking pan that is similar to a cookie sheet. It has raised sides, which will keep your pumpkin roll batter from spilling over the edges. Here is a link the Chicago Metallic pan that I use in my kitchen. I prefer a non-stick finish for this recipe. Q: Do I need to use parchment paper? If so, where can I find it? A: Yes, back in the day, my Nana used wax paper, but I only use parchment. You can find parchment paper near the foil and plastic wrap at your local market. Make sure you spray the parchment with non-stick cooking spray as stated in the recipe. Q: How do ensure an even layer of batter in the pan? A: Once my pan is prepped according to the directions, I pour the batter in and spread it around using a small offset spatula. Once it looks pretty even, I’ll tap the pan on the counter a couple of times. By spreading the batter evenly, you’ll end up with a uniformly shaped rectangle, which will create a visually appealing and even roll. Q: How do I turn my cake out onto the towel without it cracking? A: Since you are working with a hot pan, be sure to wear oven mitts when turning your cake. Place your tea towel directly onto a cooling rack. Hold the sides of the towel tightly against the cooling rack and invert the cooling rack onto your jellyroll pan. Flip the pan and the cooling rack at together and your cake will end up on the tea towel. Now you can peel away the parchment and roll the cake. Q: What kind of towel do you use? A: I don’t recommend using a regular kitchen towel because the fibers can distribute onto your cake. I use a variety of tea towels that I purchased from Cost Plus World Market. Tea towels are typically made from linen and are lint free, so they are ideal for this recipe. Make sure your towels are clean, but as a reader pointed out, you definitely don’t want to use highly fragranced laundry soap or fabric softener to wash your towels because the scent and flavor will permeate your cake. I’m thinking a lavender flavored Pumpkin Roll may be a bit of a Thanksgiving flop! Q: My Pumpkin Rolls always crack, what am I doing wrong? A: I always recommend that the cake get rolled into the towel as soon as it comes out of the oven. When the cake is rolled while warm, the heat and moisture will help lead to a crack free cake. The cake is much more likely to crack if it is rolled when cooled. Q: How tightly should I roll the cake? A: Once you turn the cake onto the tea towel and peel away the parchment, you’ll need to roll the cake in the towel. I usually roll them pretty tight – this will ensure that you end up with those gorgeous spirals of filling. Q: Once rolled, how long should I allow my cake to cool? A: You want the cake to cool completely before filling it. This will ensure that your cake holds its rolled shape. Q: Your filling is so even? 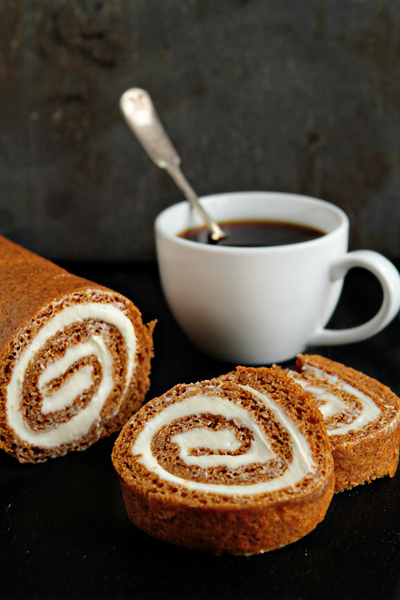 How do you fill your Pumpkin Rolls? A: I simply unroll my cooled cake and pile the cream cheese filling into the center. Then I use a small offset spatula to evenly spread the filling across the cake. I like to leave about leave about ½ inch around the perimeter of the cake bare. This keeps the cake filling from oozing out the sides after it is rerolled. Q: How do I store the Pumpkin Rolls once they are filled? A: Once I fill and reroll my Pumpkin Rolls, I wrap them tightly in a piece of plastic wrap and then again in a layer of foil – making sure that the ends are sealed well. At this point you can store them in the refrigerator for a few days or you can freeze them for up to a month. Remove the roll to room temperature about an hour or so before serving. It’s also easier to cut when it is frozen. So I’ll typically slice it right out of the freezer then arrange on a platter for about an hour. I prefer my Pumpkin Roll to be chilled as opposed to room temperature – in fact, also adore it frozen! Now head on over to my Pumpkin Roll Recipe! Hi Blanche – Are you adding the powdered sugar before you put it in the fridge, or just before serving? I would wait to add the powdered sugar until just before serving and see if that helps. Happy baking! Can you roll the pumpkin in the parchment paper or does it have to be on the tea towel? Hi El – I personally always use a tea towel, though I have had some readers who have used parchment paper with success. Hope this helps! Can you use a glass baking pan of the same dimensions in place of the jelly-roll pan? Hello! I haven’t attempted this recipe in that kind of a pan, so I am not sure of the result. Glass and metal pans tend to bake up slightly differently, though, so definitely keep an eye on it while it’s in the oven. If you happen to give it a try, I’d love to know how it turns out. Thanks so much for stopping by. Is there anything else you could roll the cake in besides a tea towel? Hi Pamela – I always use a tea towel, but some readers have had success using parchment paper. Hope this helps! Can I use plastic wrap instead of parchment paper? Do you turn the cake on to a powdered surgar towel? Hi Linda – Yep, you sure do! Make sure to sprinkle the towel with a generous amount of powdered sugar. Hope this helps!